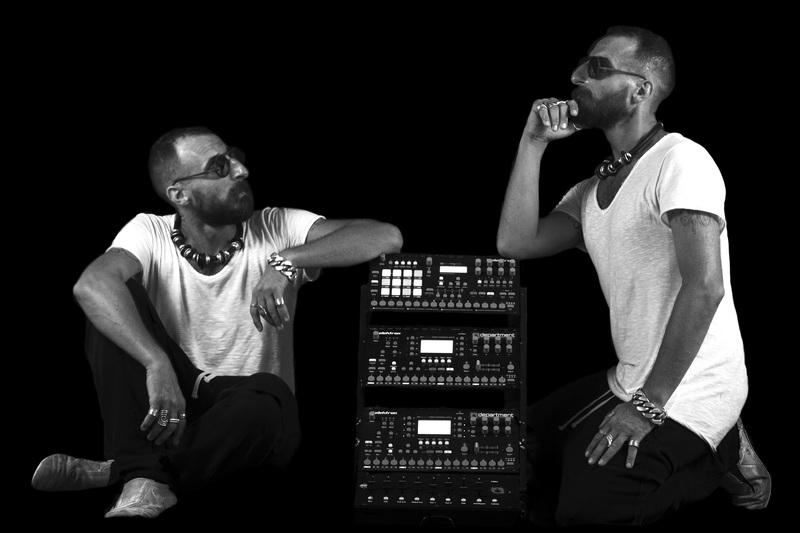 The legendary Italian DJ has a new live project focussed on Elektron machines and a cutom built suitcase. We caught up with him to find out how it works, the vision behind it and what's next for the future of live electronic music. Why was it important to you to develop a live set over DJing? "After more 20 years on the turntables, I wanted to come back to the music scene with a new project, a new name and something fresh to express. I've always been fascinated by live performances. I've been studying a good setup for a while with all the sound potential of my recording studio. Finally, after more than a year, I can say I've found the right solution and also the right time: this autumn I'll release my first album with the nick of my last project 'AudioHell', so we'll organise my live tour after the release output." What did your live setup consist of originally? "At the beginning I wanted to create a setup using the classic Ableton Live with my Moog Sub Phatty, a Roland TR8, my Oberheim DMX and an Elektron Octatrack as sampler. Scenically the idea could be very nice, but then I decided to go for a transportable solution without a computer. My idea was to have all the music in a suitcase like a DJ, so I've the copywrite on this as I designed this myself!" "I find the idea of ​​having the whole set in your head really interesting, without knowing graphically where you're going"
How did you end up using just Elektron machines? Is the lack of a laptop important to you? "I think Elektron is a company at the highest level and perhaps my favourite. I own eight of their analog pieces in my recording studios and I can safely say that the sound quality is still unsurpassed: really jewelry for connoisseurs. "Regarding the laptop I think it's much more interesting doing without it. Obviously with the computer it would have been simpler – if there's one thing I do not like about Elektron it's the tiny and indecipherable screen – but i find really interesting the idea of ​​having the whole set in your head, without knowing graphically where you're going. I know it's much more challenging, but I love challenges." How does your live set up work now? "I set it up in a very unusual way, which has nothing to do with the classic way of using Elektron machines. The set up includes two Elektron Octatrack, an Elektron Rytm and an Octakontrol all chain-linked via MIDI and connected in a craft structure that fits perfectly into a custom suitcase for travel. This will allow me to keep all the machines connected and to open them up to a height of about 65cm. All these machines enter an artisan soundcard that I have built with the technicians of my studio, about 15cm x 8cm – a real gem. "The centrally positioned Elektron Octatrack contains the rhythmic basses that can be changed, filtered and distorted from the same machine in live mode. The Elektron Octatrack in lower position contains the sounds I prepared in the studio that, besides being modulated by the same machine in live mode, are also driven by the Octakontrol, located at the bottom of the structure, which in this case becomes like a real bench studio mixer. The Elektron Rytm is positioned at the top and with its analogue power will play live all the rhythms and the effects at my discretion. This mechanism, combined with a uniformity of tones and sequences of sounds prepared by me in the pre-production studio, will give me the chance to play the live set with maximum imagination, freedom and improvisation on the music. Each live set will be different from the other: pure fantasy!" "Each live set will be different from the other: pure fantasy!" What’s the biggest challenge about performing electronic music live? "Of course, before deciding to prepare a live performance, I usually listen to several live sets during my 23 years in the electronic music scene. I can safely say that, unlike DJ sets, with live performances I have two main issues. "The first is that live performances are very bound to what you have prepared before in the studio – the DJ instead can decide whether to put a record or not just based on the reaction of the dance floor. That is why I decided to keep the maximum space for improvisation in my set up. The second problem is many times the sounds becomes too repetitive or boring after twenty minutes, especially in live sets without laptops. I chose the Octatrack solution mostly to keep several samples or rhythm bases I can mix with my tracks: Radiohead, 80s pearls, classic techno, old rhythm tracks can always be mixed to my songs or even combined together! I don't want limits and constraints: only pure fantasy dictated by the emotion of the moment." What do you think is behind the current trend of more artists performing live? "I think today the club culture has changed a lot. We went from the standard vinyl support of the ”90s to Traktor on the laptop with auto sync and songs downloaded at two dollars or received for free directly on email from thousands of agencies of music promotion. I think today everyone can do DJing – technically and musically speaking. This is the real reason why people need go back listening to live performances. My opinion? Live will be the future. I grew up with bands like Underworld, Cassius, Faithless. Why not start over again based on that? What advice would you give to someone who’s thinking of taking their studio on the road? "My advice is to think above all at practicality. In my opinion it is useless to set the live with too many synths because then it becomes very hard to manage when comes to to travel.I have many analogue machines in my studio, I love them and I would take them everywhere. For booking needs, however, unless you have reached a very high level, many clubs are not prepared – territories like Asia for example. My advice is to create an intelligent setup starting only from the instruments that are really indispensable for your performance."